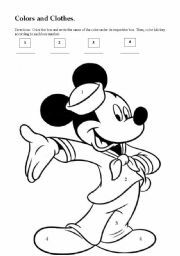 Tell students to color each box and then color Mickey according to each box number. Easy and funny!!!!! Worksheet for basic students. 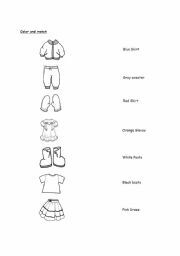 This is a very useful worksheet for young ESL to acquire vocabulary about clothes and colors. 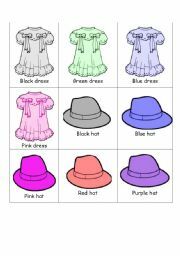 You can ask students to read the name and the color of the clothes and then students have to match it and color it. This file is the complement for the bingo game. 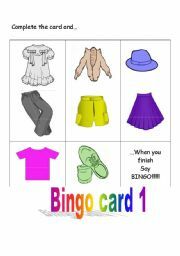 Here you will find the flashcards with the clothes item for my bingo game. This is the BINGO game for young ESL. In this file you will find the the game cards for playing with your students. The only thing you you will need are ten bottoms for each card. 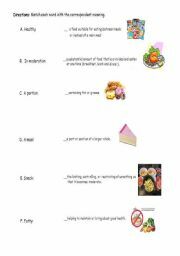 This is a worksheet for intermidiate students match the meaning of some useful words with their respective meaning. This a summarize of the rules for making the comparative form of adjectives. Good for a multimedia class.